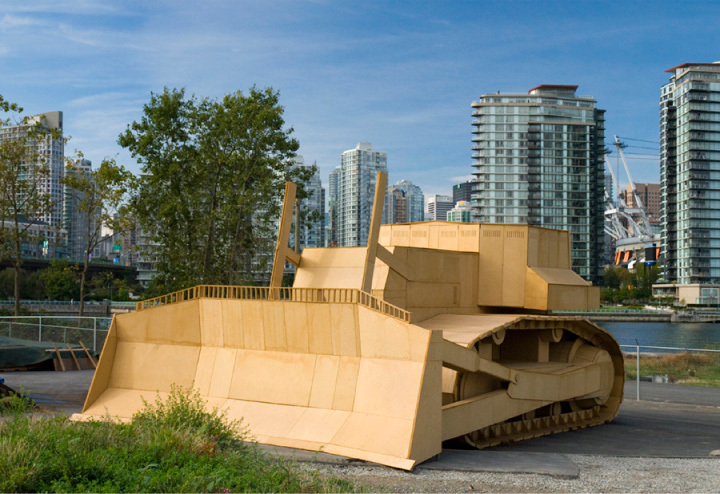 Folke Köbberling and Martin Kaltwasser’s The Games are Open presently takes the form of an oversized bulldozer that sits on the west side of Vancouver’s Southeast False Creek’s Olympic Village. A gargantuan mock-up of the very machine that was recently used to raze the surface upon which it sits, the object appears to be permanent, dominating and perhaps even obtuse. Appearances, in this case, can be misleading. Rather than a static example of ‘plop art’, this colossal model performs a dialectical dance between notions of legacy and the forces of entropy, operating in turn as both monument and anti-monument. While the bulldozer references the site’s recent past, it’s own material instability unfixes one’s gaze from the past towards the future. Constructed from wheat board (recycled wheat stalks and non-toxic binders), in time this untreated composite board will decompose and break down under the force of the elements. This process will be further hastened by loads of fertile soil placed within the bulldozer’s cavities during its construction. As the elements come into contact with the soil, the soil will develop enzymes that will overtake and undo the form of the dozer, forcing the formal rigidity of this monumental sculpture into a fertile, compliant heap. This transfiguration of form will also allow an authorial switch: as it decays and deviates from the form given to it by its creators, members of the local community will plant seeds and eventually harvest their bounty. Thus the dormant object becomes the catalyst of dynamic, regenerative processes, both social and ecological. This aspect of transfiguration and community involvement is the core of Köbberling and Kaltwasser’s practice. Once dubbed ‘recycling activists’, they mine the urban environment for it’s ‘waste’ material, then reconfigure this excess into tangible objects, spaces or experiences in an attempt to illustrate both unspent potential and our own implication in this state of affairs. In The Games are Open, the wheat board has been salvaged from the Athlete’s Village, where it was used as a protective sheathing for the brand-new, pre-sold condos during the 2010 Winter Olympics, presumably to prevent damage incurred by the athletes themselves. To reclaim this material and put it on display is not only an act of economy, but also of disclosure, as it reveals hidden bureaucratic procedures and strategies of the Village. This act of disclosure speaks, in effect, to processes of sublimation, repression and aggression within the capitalist milieu. While the monetary value of these condos is undoubtedly high, their social value and impact is still to be determined. Having been sold on the potential for profit and growth should Vancouver win the Olympic bid, citizens were also persuaded that elite sport and its performers provided role models of achievement and perseverance, moral fortitude and strength. However, when it came down to protecting investments at the Olympic Village, distrust and fear prevailed: what if these athletes were more hooligans than heroes? What if, in a drunken fury over a lost game or race, an athlete behaved less like a paragon of virtue and more like a depraved, drunken rock star? Rather than a symbol of strength and dignity, ‘the athlete’, was feared for his brute strength and perceived latent tendencies towards violent behavior. Rather than a utopian village inhabited by demi-gods, this well-ordered configuration of glass and steel was in fact outfitted for worst-case scenarios. The impulse to cover the valuable interior finishes, seemingly neurotic, actually adheres to the logic of the rationalizing strategies and techniques of the modern city. In a recent essay in Fillip magazine, Jeff Derksen analyzes the willful erosion of public space in Vancouver, contrasting the rhetoric of postmodern development, which emphasizes the importance of local histories and social inclusivity, with the still-present modernist strategies of erasure and control. In this city, Derksen argues, the objectives of postmodernity are reduced to decorative motifs and flourishes, while the release valves of inclusion and democracy are capped. The powerful instrument of the bulldozer, in the Tabula Rasa of this context, serves as a functional critique and a reversal of these top-down designations of space and the erosion of the public sphere. As the literal representation eventually gives way to the forces of entropy and decay, it will reveal latent tendencies within the sculpture itself. The opportunity to transcend the limits of representation and authoritative control are exchanged for opportunities for community engagement and organic liberation. Köbberling and Kaltwasser’s approach to creating a public art legacy within the post-Olympic context is both defiantly optimistic and tongue-in-cheek. Utilizing plebian references, such as a form modeled after a Lego bulldozer, and the act of planting a seed (read: grassroots activity), their work relies on legibility and acceptance from the public in order to fulfill it’s own destiny. This invitation to participation attempts to reverse the authority of modern developmental regimes and create an opportunity for spatial agency where little currently exists.